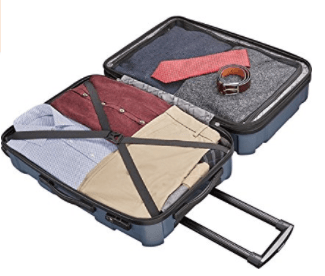 Samsonite Centric 92794 is a 20-inch size hard side cabin size suitcase made of hundred percent polycarbonate with nylon lining. You have six color options of black, burnt orange, Caribbean blue, blue slate, teal and silver with minor price differences which you can view on the product page through the links. You can also purchase this 20-inch carry on bag as part of a set (102691) of three suitcases of 20, 24 and 28 inches. And you can also get the other two larger bags- medium (102689) and large size (102690) separately. All four options are available on Amazon at the time of this review. Centric has a unique design and shape and the twill micro-diamond texture will help maintain the appearance of the suitcase over time. It will stay intact, free of scuffs and scratched even after many travels. The grooved aluminum telescoping handle tubes are solid and sturdy but lightweight. It also has the co-molded side and top handles with rubber grip for your comfort and convenience. Bold new panel architecture with dense corrugation makes the luggage stronger and more durable. The convenient multi-directional 360-degree spinner wheels are re-engineered and lightweight. 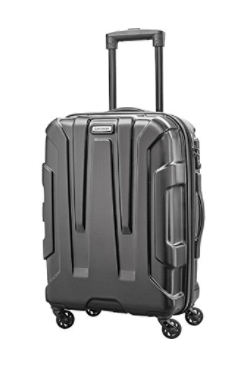 You will enjoy being able to roll the luggage effortlessly with both the lightweight wheels and handle. It will feel like rolling easily beside you rather than you pulling it. Inside, you have the elastic cross straps on one side and the fully zipped mesh divider so you can better pack and organize your stuff. You will also find a neat and stylish tonal logo print inside. The 20-inch cabin size luggage itself weighs just 6.5 pounds in total despite having the sturdy hard side exterior and has the measurements of 20.5 x 14.5 x 9.5 inches. The 24-inch weighs 8 pounds and measures 24.5 x 16.75 x 11 inches and the largest 28-inch weighs 10.8 pounds with the measurements of 29.4 x 19.9 x 12.4 inches. All the 20, 24 and 28-inch suitcases are expandable by 1.5 inches, by simply unzipping the full zipper in the middle. Each Samsonite Centric luggage comes with a side-mounted TSA combo lock for better security and you can have a peace of mind as only the TSA staff can check the contents of your bag without having to break the lock. Whichever size you choose, Samsonite is a very reliable brand and the Centric bags are offered with an impressive 10 years of warranty by the company. It looks stylish and beautiful, is sturdy, durable and lightweight and has an ergonomic design. Samsonite Centric is an imported product but a US stock and shipping will be quick, with the security provided by Amazon.com.